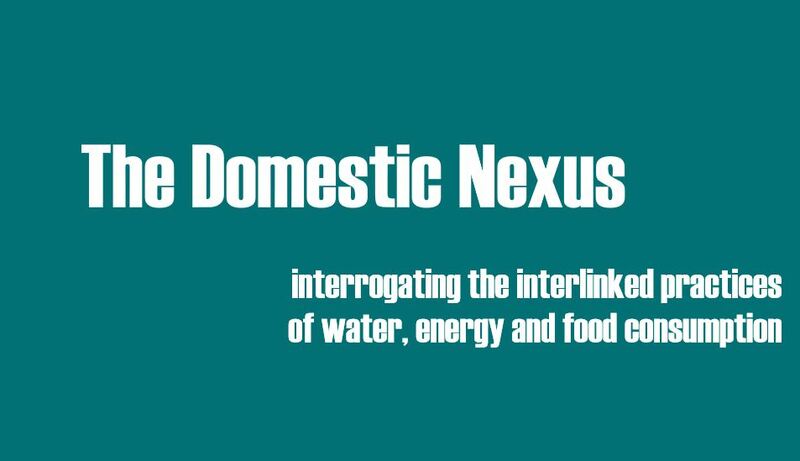 The focus of the second workshop in the Domestic Nexus series was on researching and understanding changes in domestic practices which can reduce demand for resources was . It took place on 23rd November, at Manchester Friends Meeting House. 35 participants, including from Aalborg, Tartu and Roskilde as well as from around the UK, chewed over ideas and issues in a packed programme of talks and discussions. 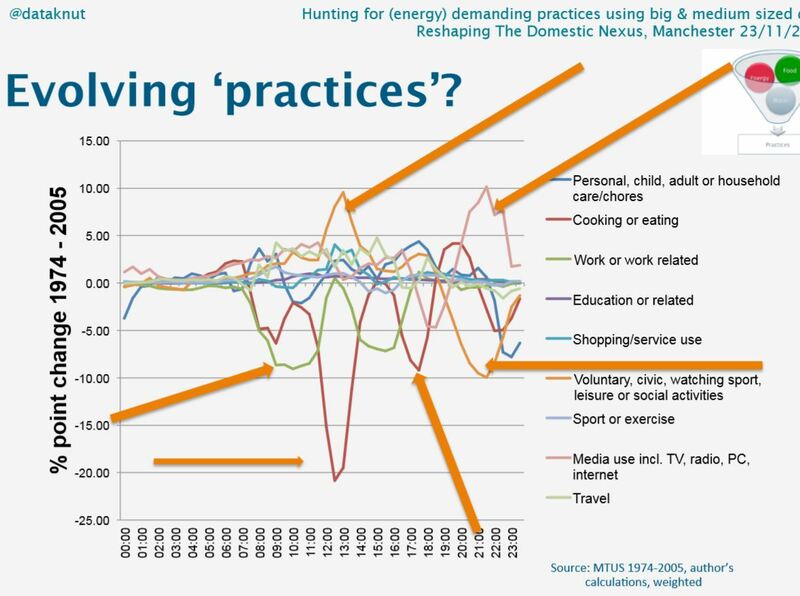 Ben Anderson (University of Southampton) opened up the day’s discussions with a talk entitled Hunting for energy-demanding practices using big & medium sized data (slides here). How to track and analyse practices beyond daily snapshots by moving to population level data? Ben revealed how much more sense of what people actually do can be had from time use data compared to the expenditure survey which typically informs policy on consumption, moving on to explore the emerging potential of techno-traces with the proliferation of monitoring technologies and the internet of things. In conclusion though, recognition that often big and medium data analysis raises questions at least as much as giving answers; is it time for ‘big ethnography’ to work alongside the big data? Jen Whillans (University of Manchester) followed Ben. Using time use survey data to understand domestic practices gave an excellent guide to the value of time use survey data in understanding temporal patterning of resource use, particularly issues of duration, sequencing, timing, synchronisation and desynchronisation, and what trends in practices’ temporal character mean for resource consumption. After coffee, Bente Halkier (Roskilde University) took on the tough job of presenting ‘the orthodoxy’ of qualitative methods. 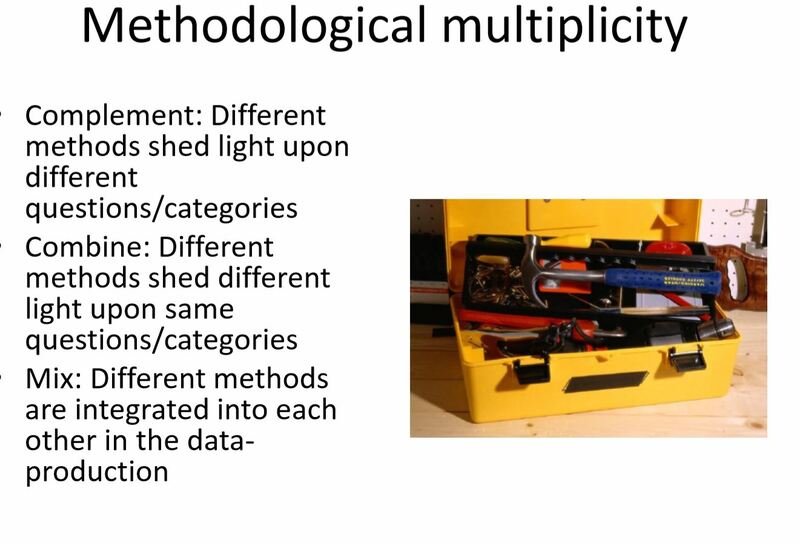 Bente sensibly put a spin on the task, by giving plenty of food for thought on the possibilities, potential and pitfalls of combining methods, with a talk called Methodological multiplicity rather than truisms (slides here). An emphasis on multiplicity provided an excellent framing for the next presentations, which pushed methodological well beyond orthodoxy. Lenneke Kuijer (University of Sheffield and TU Delft) brought design research into articulation with social science approaches to understanding practices, in Design approaches to reshaping the domestic nexus (slides here). 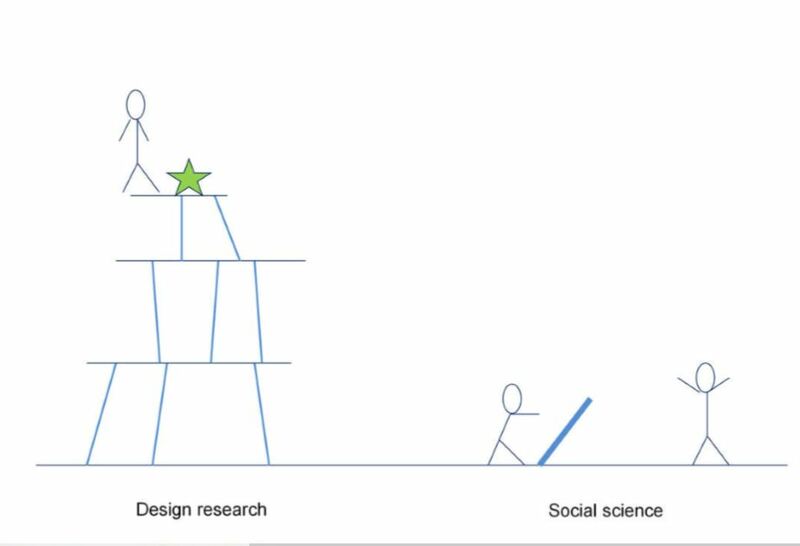 She introduced her own engagement with improve performances as a means to interrogate potential future changes to practices, before some really insightful and graphically represented differences identified between social science and design research approaches to inquiry (above). Lenneke’s emphasis on experimental methods and forms of laboratorisation of inquiry set up continuities for the next session. 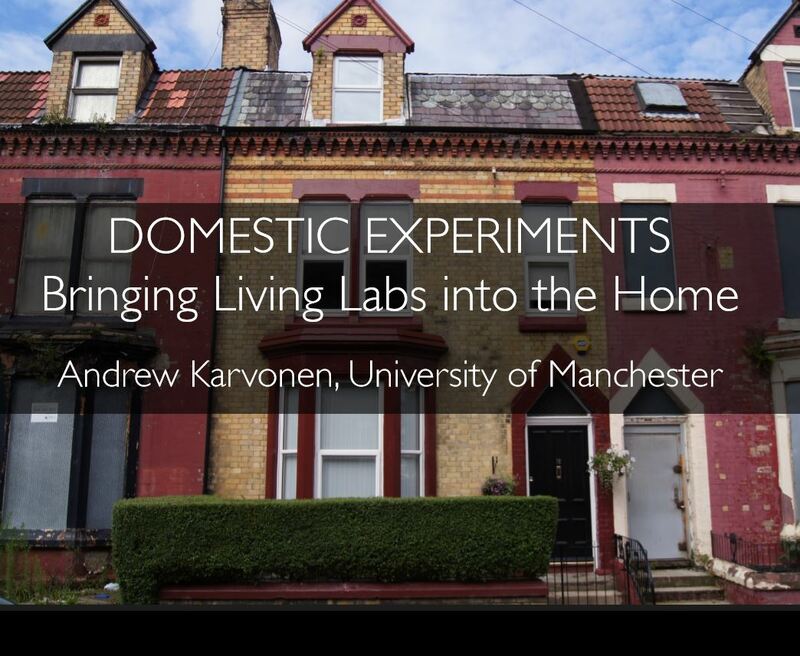 Andrew Karvonen (University of Manchester) in Domestic Experiments; Bringing Living Labs into the Home (slides here) introduced a range of living lab experiments, from Salford’s energy house, a reconstructed conventional terraced house in controlled laboratory conditions, through to community group run Carbon Coop in Manchester, as ways of thinking about living lab approaches to housing retrofit and to thinking about changes in relation to the nexus at home. Finishing off the morning sessions, Frank Boons (University of Manchester) presented to the title the water-energy-food nexus: reflections on conceptualisation, methodology and policy impact. It provided us with a great deal of food for thought over lunch, outlining contrasting conceptual approaches to the energy-food-water nexus and how those different approaches related to . First in terms of interconnection – systems approaches and what they mean in terms of seeking leverage points, including whether and how households might constitute such points. Second the nexus as nodal points, bringing actor-network theory into play. Finally, nexus as social site, turning to the practice theory approach at the root of the workshops, raising critical questions about how boundaries can be put around the household; and how widely boundaries need to be set to engage with the arrangements and relations constituting domestic practices and the demands for resources they constitute. As so often in such events, lunch passed too fast, but gave way to a lively afternoon. We moved away from methodology towards different ways of understanding change in domestic practices that do not rely on interventions directly on individual behaviour. 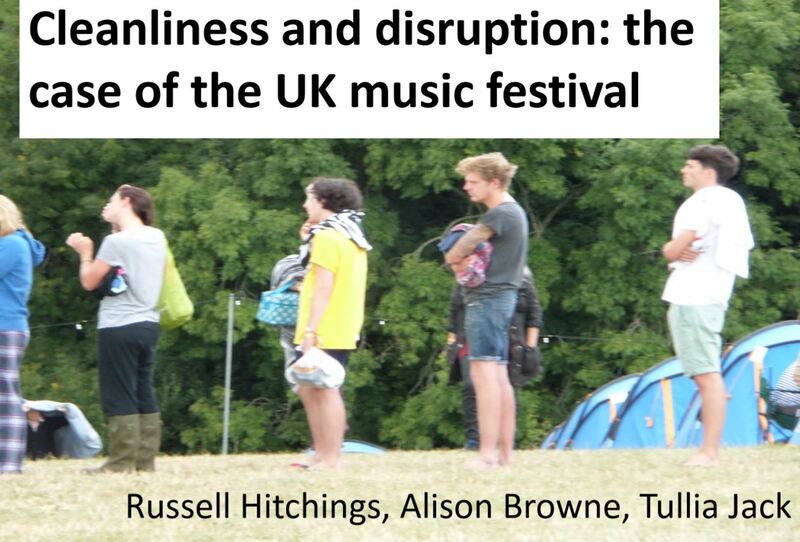 Russell Hitchings (UCL) got us off to an engaging post-lunch start accounting for research done with Ali Browne and Tullia Jack on Festival camping as a disruption to water use routines: a mixed method study (slides here). Festival camping as a natural experiment presenting profound disruption to cleanliness practices. What holds in the face of the challenges of keeping clean in a muddy field, what is let loose in the time limited space of escape the festival. 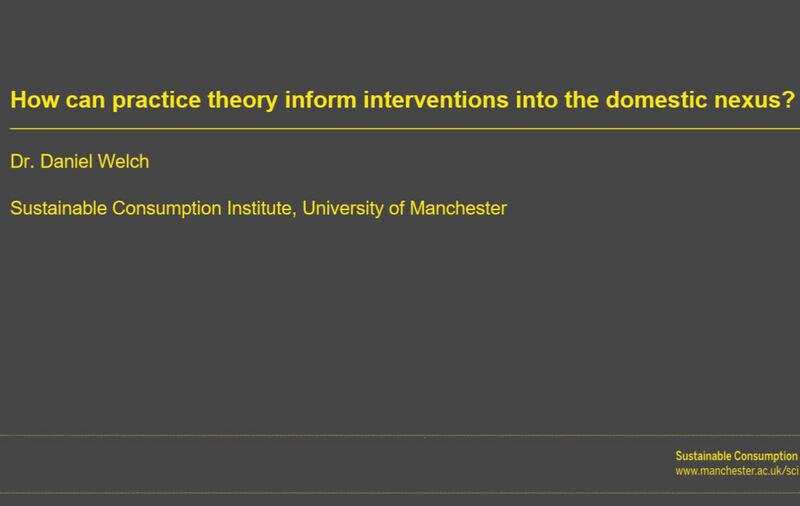 Dan Welch (University of Manchester) introduced a change of pace, with some heavy theoretical propositions in relation to different ways of theoretically engaging practices, asking How can practice theory inform interventions into the domestic nexus? (slides here). Dan gave us an erudite account of the distinctive value of practice theory – particularly from work informed by theorisation by Theodore Schatzki, as a basis for a series of critical reflections on the marginalisation of the agent and the prioritisation of the ‘non-declarative’ – the habitual, tacit and so on – in contestation of social theory’s conventional prioritisation of the ‘declarative’. This provided the basis for critical reflection on the value-action gap, as against Schatzkian approaches to the teleoaffective. Margit Keller (University of Tartu) gave us another change of pace, a break from the back to back speaker presentations and questions with an invitation for us to try out one of the tools worked through in the recent book From Intervention to Social Change, which Margit co-authored with Triin Vihalemm and Maie Kiisel. After talking to the title Towards practice-based tools of analysing and planning interventions into the household Margit got us all working through the entities, practices, relations and agents involved in the generation of domestic food waste. This drew out the profound relationality of phenomena like food waste, from details of temporality within the home to globally distributed systems of food provision. After tea, Tse-Hui Teh (UCL) introduced us to the challenges of water stress in London, and her research into how water infrastructures relate to variations between and changes to practices. As the title, Coevolving Greywater in London, suggests the talk focused particularly on different ways that some respondents already made it possible to reuse grey water (water that has already been used in the household); and on the potential and limits of making greywater reuse more normal, including in relation to scales and ownership of greywater treatment and storage infrastructures. Finishing off the day’s illuminating presentations, Simon Marvin (now University of Sheffield) drew on autobiographical experience together with his existing work on obecities – the relations of dietary fat to urban metabolisms – to think through the constructions of bodily metabolisms and their reconfigurations in relation to changes to diet and activity, and the role of social, technological and spatial relations in those processes. Concluding discussion steadily gained steam in the limited time available. The challenges of researching the household without reifying it as stable or easily characterised; things that seemed to be lacking from discussion like personal relationships or the rapidly changing role of social media in both changing practices and in challenging anew the ‘membranes’ of the household and more. Time had to be called long before momentum was spent, but discussion continued in Brewdog down the road.